Sister Hilda, the mistress at St. Mary’s Villa, arranged for Margie to see Mother Myles, SSND. Margie asked admittance to the School Sisters of Notre Dame and received the bonnet at the SSND motherhouse on Aisquith Street in Baltimore on Aug. 28, 1949. At reception, July 16, 1952, she was given the name, Sister Hilda Marie. Sister Hilda Marie professed her first vows on July 24, 1953. As a professed sister, Sister Hilda Marie was sent to St. Vincent’s Home, Tacony, Philadelphia. 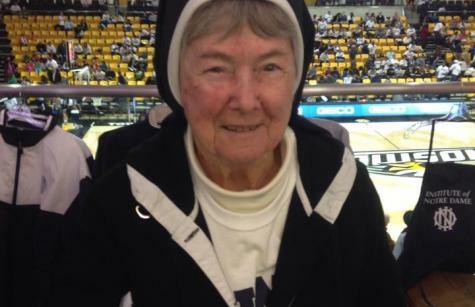 She remained there for a year as “girl’s prefect.” After a short time at Holy Angel’s Academy working in the sisters’ refectory, Sister Hilda Marie returned to the SSND motherhouse and the Institute of Notre Dame, which would become her home for most of her remaining life. While there, Sister Hildie, as she became known, was engaged in domestic work and assisted at the nearby Sts. James and John School. In the years after the motherhouse moved to the North Charles Street location, the Institute of Notre Dame became the focal point of Sister Hildie’s life. She was involved in many aspects of the school, from housekeeper and bookstore manager to director of housekeeping and director of the plant. Even following her 2016 retirement, after more than 60 years of service, she remained a volunteer at the school. Her life was inextricably intertwined with IND. The diminutive, four-foot tall Sister Hildie became the heart of IND. She made the school a home where everyone was welcome. Her uncanny knack for being present led her to greet the students with her friendly smile as they arrived and to close the day with a word of encouragement. She touched so many lives because she paid attention to everyone. Hildie was witty and had a great sense of humor. She liked to make people laugh and loved to put a smile on the girls’ faces. And she was kind. She was kind to every girl who walked the halls of IND. Her generous spirit made her caring and giving to the students, whether it was bus fare or food or whatever was needed. The students learned from her. She taught them to care about others more than themselves. Hildie’s deep sense of service to people who were materially poor led her and Hildie’s Helpers, the IND student outreach program, to provide food and clothing to those in need. She served the poor, the humble and homeless of the East Baltimore neighborhood surrounding the school. Passionately devoted, Hildie lived the Gospel message and made an impact wherever she went. She truly lived her legacy: to see Christ in all people. Sister Hilda Marie died on March 14. The Christian Wake Service was held on March 21 in the chapel of Villa Assumpta. Additional visitation was held at the Institute of Notre Dame on March 22. The Liturgy of Christian Burial was celebrated at the Cathedral of Mary our Queen, Baltimore on March 23. Mgsr. James W. Hannon, Director of Clergy Personnel and Western Vicar for the Archdiocese of Baltimore, was the celebrant. Interment followed at Villa Maria Cemetery, Glen Arm Rd., Glen Arm, Md. Sister Hilda Marie is survived by her sister, Mabel Bents; niece, Elizabeth Grier; nephew, Thomas Bents, and other nieces, nephews, grandnieces and grandnephews.